Learn how to choose the best portable fire extinguisher for your home or office. For many commercial businesses, having the right portable fire extinguisher becomes a necessity. In fact, the biggest consideration that a business owner needs to have is understanding the type of fire that is most likely to occur. Fires are categorized into different types of classes. 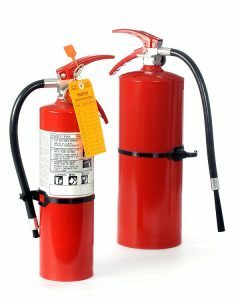 As a result, depending on the materials present in a business, there are certain types of fire extinguishers that need to be used over others. Here is everything you need to know about choosing the perfect portable fire extinguisher for your business. As mentioned above, you need to really be able to determine the type of fire so you know what type of fire extinguisher should be used. In fact, a building fire assessment from a certified technician can facilitate the process. One of the first things that you need to do to ensure you have the proper portable fire extinguisher in your business is to examine and make sure that the fire that is likely to occur is relatively small in scale. As their name suggests, portable fire extinguishers are ultimately best served for smaller fires that are not able to get out of control. In fact, small fires that are not extinguished can end up turning into much larger scale conundrums. Let’s be clear. Placement of a portable fire extinguisher is key here. In fact, portable fire extinguishers should be placed in a visible location that is easily detected. This is so that if an untrained person is in the building, they have the ability to easily see and access the fire extinguisher as needed. Fire extinguishers should also be placed in easy to reach places like near exits and in corridors or aisles. This entry was posted on Friday, August 3rd, 2018 at 11:24 am. Both comments and pings are currently closed.